Anything, and I mean anything recorded by Brazilian pianist and composer Fabio Caramuru is a treat. Team him with bass guitarist Pedro Baldanza and it’s going to be a good time. This Sao Paolo based duo blends Brazilian Classical and popular musical styles to create musical magic, and also interpret songs from Brazilian and North American artists along the way. Drawing on American Jazz traditions and styles, Duo Caramuru/Baldanza add in dashes of Brazilian musical culture to create a sound that is both foreign and familiar; familiar yet new. One of the reasons that Brazilian Jazz draws so many devotees is that there is still a view of Jazz as an art form instead of platform in Brazil. The focus here is still on making great music, rather than seeing how many notes an instrumentalist can fit into a run. There is an understanding that there are times for such polyphonic spree, but also times when more said when less is spoken. Fabio Caramuru is a master at knowing what to say with his piano, and when to say it. He understands when a moment of silence is more musical than any notes he might choose to play, and Pedro Baldanza is the ultimate foil to Caramuru’s artistry. 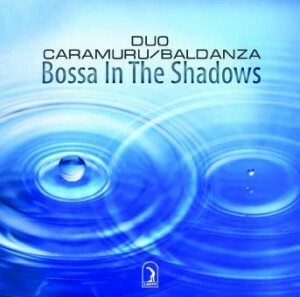 Bossa In The Shadows is an on-going discussion between these two great artists that should have tongues wagging from New Orleans to New York to wherever Jazz finds a home. There are too many highlights – passages even, to mention specific songs or moments. If you are an aficionado of great jazz, or if you are a neophyte who wants to experience and understand the artistry of the form, then Bossa In The Shadows is essential listening for you. Really, the CD is amazing !! I got mine last week…you should get yours! Congratulations to the Duo ! !